For 50 years, in Mexico and then New York City where she moved in the eighties, Latin Americanist curator, former museum and non-profit director, editor and writer Carla Stellweg has advocated for a hemispheric artistic dialogue which, according to her, was never a given in the Americas. Terremoto’s director Dorothée Dupuis went to meet her at her loft in New York City’s Lower East Side. Por 50 años, primero desde México y después desde la ciudad de Nueva York —a donde se mudó en los 80s— la curadora latinoamericanista, antes directora de museos y organizaciones sin fines de lucro, editora y escritora Carla Stellweg, ha promovido un diálogo artístico hemisférico que, según ella, nunca fue asegurado en las Américas. La directora de Terremoto Dorothée Dupuis fue a conocerla en su loft en el Lower East Side, Nueva York. 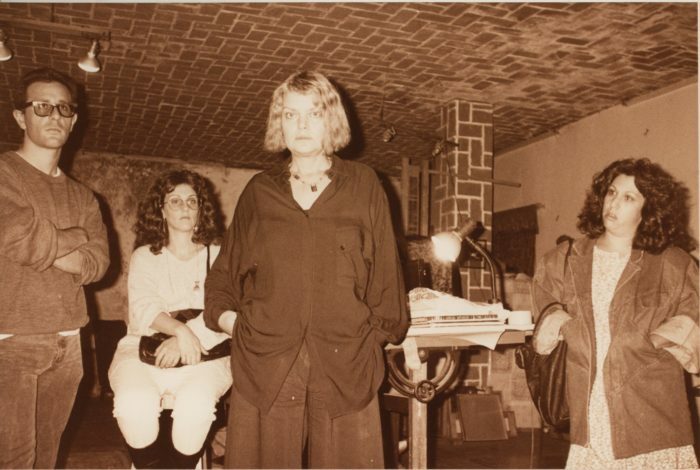 Left to Right: Rubén Ortiz-Torres, Rita Alazraki, and Carla Stellweg and Rina Epelstein, in Rubén’s studio at La Quiñonera, Mexico City, 1989. Photo by Adolfo Patiño. Image courtesy of Stellweg Partners NY LLC. Dorothée Dupuis: Last fall Pacific Standard Time, a contemporary arts initiative of the Getty Foundation, was held as every five years in collaboration with more than a hundred art institutions, galleries, and independent spaces in the broader Los Angeles area. This edition’s theme and focus was the connection between arts in Latin America and Los Angeles, as well as with the larger Latino arts communities. We decided to dedicate the fall issue of Terremoto to Chicanx/Latinx art practices, articulating the theme around the concept of smuggling. 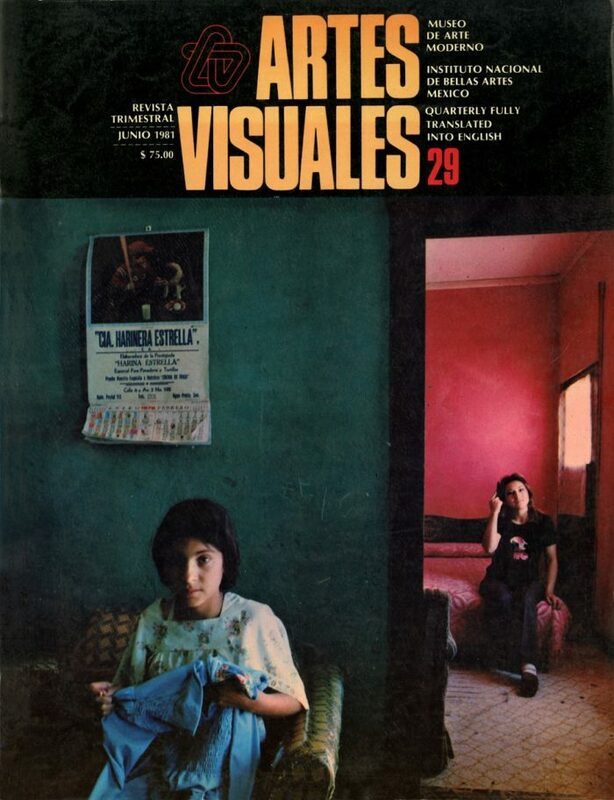 Since I learned about Artes Visuales, the bilingual quarterly magazine produced by the Museo de Arte Moderno (MAM) in Mexico City from 1973 to 1981—and which you were a co-founder and director of—I have been thinking about the striking similarities between our two publications. Could you first tell me about the concept of Artes Visuales? Especially about the issue dedicated to Chicano art in 1981? It seems you were the first magazine to really address that subject. Carla Stellweg: Yes, we were the first magazine in Latin America to focus on Chicano art. In 1979, the Los Angeles Institute for Contemporary Art (LAICA, as it was known) invited me as an NEA (National Endowment for the Arts) Critic-in-Residency to edit a bilingual issue on Latin American art for their journal. I drew up a five-point questionnaire that I sent to a select group of Latin American curators, arts professionals, and artists living and working in Latin America, as well as some living and working in the US. Of the 5 questions, the last asked what they knew or had heard in regards to Chicano art. Only two people responded to this question, one was Hélio Oiticica and the other Luis Camnitzer. At any rate, the NEA required that I conduct two lectures around Los Angeles. At the first talk, there were two Latino guys who sat in the front row and posed some very articulate questions during the Q&A session at the end of the talk. Afterwards, they left before we could be introduced. Two weeks later, at another venue the same two guys were again seated in the front row. This time I approached them and commented, “You know, I am not going to do a different lecture than the one you already heard, so you might get bored!” I then suggested we had dinner together in Chinatown afterwards. It soon became clear that they had their fingers on the pulse of what was happening! Before this I had started to look into dedicating a specific issue about the amazing new art coming out of Cuba—the first generation of graduates from the Instituto Superior del Arte (ISA)—this was a little before the Havana Biennial, which was begun by Yillian Yanes. Instead, I asked my new Latino friends, Roberto Gil de Montes, one of the founders of LACE (Los Angeles Contemporary Exhibitions), and Eduardo Dominguez or Eddy, if they would be interested in doing studio-visits all over town if I extended my stay, and suggested that perhaps, after assessing the material we looked at, we could think about doing an entire issue of Artes Visuales on Chicano art. My interest was more in the conceptual new art and popular Chicano visual culture—photography, comics, photo-novelas, video art—than the more traditional Mexican Muralist heritage. This first issue on Chicano, or if you will, “Latinx” art—as it is called today, was not so much serendipitous, but the result of asking the right questions at the right time. If I hadn’t asked them to join forces with me, the Artes Visuales issue might have been a much more conventional representation of Chicano or “Latinx” art than the one we ended up editing together! Cover of Artes Visuales, No. 29. Published by el Museo de Arte Moderno, Instituto Nacional de Bellas Artes & Secretaría de Educación Pública, Mexico City, Summer 1981. Cover Artwork: Louis Carlos Bernal. Scans by Tessa Morefield. Image courtesy of Stellweg Partners NY LLC. DD: You had this successful career in Mexico City starting in 1965 and through the eighties. You were editing the magazine Artes Visuales, as well as working with Fernando Gamboa, one of the most important institutional directors of his time. Then, in the eighties we find you back in New York. What happened? Left to Right (forefront): Husband of Doña Margara Garza Sada de Sepúlveda; Doña Margara Garza Sada de Sepúlveda; Rufino Tamayo, President José Lopez Portillo; Fernando Gamboa; and Carla Stellweg, at the opening of Museo Tamayo, Mexico City, 1981. Image courtesy of Stellweg Partners NY LLC. DD: You often define yourself as a Latin Americanist—how does that include Latino Art? CS: Prior to PST LA/LA last year, there were several panels at the Getty. I was invited to two of those, and Ruben Ortiz-Torres moderated one. In another panel regarding the LACMA Home show, the artist Daniel Joseph Martinez was one of the participants, with Mari Carmen Ramírez, Chon Noriega, Gerardo Mosquera, and several others. The subject of what Latino art is or was came up. Then, at some point, Martinez interjected. “There is no such thing as Latino Art!” It’s just like Latin American art, what is it? It can be many things! Over the past 40 years the question keeps popping up. From my perspective, a Latin Americanist is someone who dedicates him/herself to the creating of platforms to further the visibility and knowledge around works made by artists from or in Latin America, whether they be political, conceptually engaged, or all the different forms of abstraction, including concrete, neo-concrete, kinetic, and optic art… In my case, it wasn’t a decision, it just happened. I am a Dutch citizen who moved to Mexico when I was 16. My intellectual formation was largely a product of my years in Mexico and Latin America. I adopted Mexico as much as Mexico adopted me. Being a Latin Americanist is not essentialist, it’s a practice, and in my case I made a point of including the Latino artists in that category. I didn’t grow up with Latinos, but today there are some 30 million US citizens of one or another Latino origin, a composite of immigrants from Cuba, Puerto Rico, Dominican Republic, plus all the other Caribbean nations, and Chicanos. Spreads of Artes Visuales, No. 29. Published by el Museo de Arte Moderno, Instituto Nacional de Bellas Artes & Secretaría de Educación Pública, Mexico City, Summer 1981. Scans by Tessa Morefield. Courtesy Stellweg Partners NY LLC. Returning to what Latin American art is: The need for a hemispheric dialogue has always existed. Traditionally, in the US, the East Coast has always been considered to have the most economic and political power; New York City, Washington DC, Boston, all looking toward Europe and connected to it for multiple historical reasons. The military machine of WW2 forged our technological revolution, and the by-product of fast communication has changed everything, especially in the art world. During WWII and the Cold War, it was geopolitically important for the US to try to improve a hemispheric discussion because there was an increasing amount of Soviet-leaning governments in Latin America that were seen as a threat to US national interest, as well as its corporate business interests. I talked about that recently in a panel at the Museo Jumex, arguing that in order to talk about the concept of Latin American art, we must first talk about the 40s and the Cold War. The US Congress and Senate sanctioned those arts and cultural programs that became hemispheric in order to create alternative networks to those they had had previously with Europe—to learn what people were thinking, and the systems that those in Latin America were keen to support politically, economically, financially, etc. The US Cold War’s cultural thrust utilized abstract expressionism and the New York School, and promoted the work of Latin American artists such as José Luis Cuevas, Edgar Negret, or Botero for instance, in exhibitions curated by José Gómez Sicre at the OAS Museum of Latin American Art in DC, or in the seminal texts on Latin American art by Marta Traba. Today, we seem to be at the tail end of abstraction, the various movements that were intelligently and solidly canonized by Mari Carmen Ramirez in her seminal exhibition and catalogue Inverted Utopias from 2004. To prefer protest-based and politically-charged art and what today is known as “relational aesthetics” seems to respond better to our troubled times and seemed for a while to be an antidote to the Frida Kahlo-ization (among other mythical figures) of Latin American art. Historically, figuration is more grounded in realism or anchored in social activism or, if you will, again “relational aesthetics.” Abstract art is more comfortable, neutral, and non-committed, easy on the eye and psyche. Carla Stellweg with Tjerk Wiegersma at the Carla Stellweg Gallery booth during Brussels Art Fair, Palais des Beaux-Arts, Brussels, 1994. Image courtesy of Stellweg Partners NY LLC. DD: In 1989, you opened a gallery in your loft in New York, leaving aside momentarily your institutional career. Why did you decide to do that? CS: I had done all these other things and undergone many professional transformations, however it was always under the umbrella of institutions. It was time to be independent, do my own project, and not be tied to an institution and its policies—at least not for a while. I had lived and worked in New York many times, a few years, a few months. After Artes Visuales was censored and ceased to exist, I came to New York from Mexico in January of 1983. I had already leased this loft back in 1978 and used to come and go four times a year. Artists would often come by to visit, and after the demise of Artes Visuales we were wondering where and how they could show and sell their work here in New York. It was clear there was an opportunity to introduce the public to something that I felt very strongly needed to be seen. Ana Mendieta used to come down to Mexico, which is how we became very close friends—at one point I even owned 12 of her works. She, as well as Regina Vater and Ana Maria Maiolino, who lived around the corner. There was Luis Frangella who died of AIDS—he lived on Forsythe Street, also around the corner. Catalina Parra from Chile was also here… I kept working freelance as a consultant until 1983, then opened a space—my first gallery—on Mercer Street in Soho, and then became the Chief Curator at the now defunct Museum of Contemporary Hispanic Art (MoCHA). In 1989 there was a crash in the market. Many Soho galleries were closing, and I thought, “What goes down must go up, and what is up must come down,” and decided to open my second space, this time in the loft. Real estate was already quite expensive, and I was living in a 4000-sq. ft. apartment without walls—one huge space. Therefore, we began by building walls, isolating the kitchen area, etc., and that is how we started, inviting people from everybody’s network, people who mattered and who were influencers. I even did art fairs, and for a while in the nineties I was actually on the exhibition committee of the Miami Art Fair, way before Basel Miami, which was also held at the Convention Center. 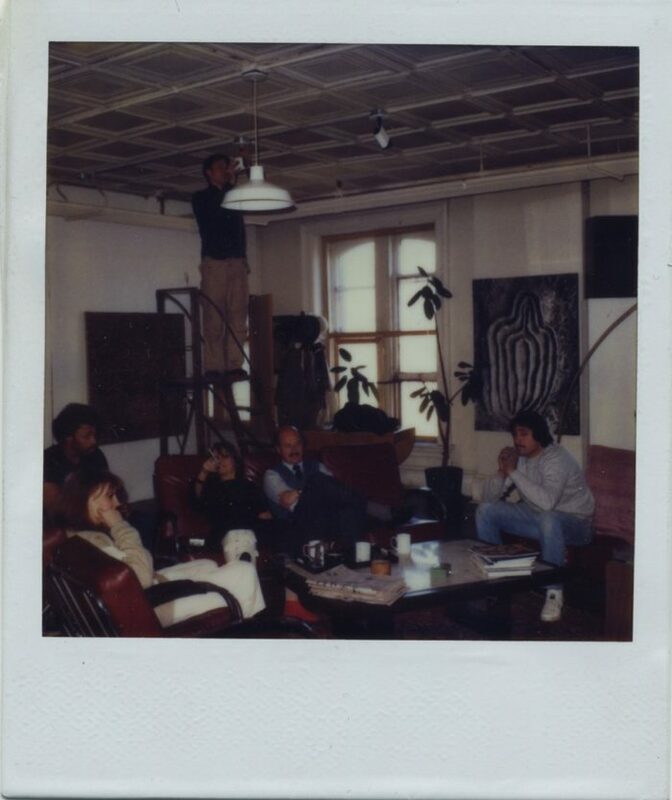 Left to Right: Dolores and graffiti artist Blade; Carla Stellweg seated next to Octavio Hinzpeter, Gallery assistant; graffiti artist Seen in front of Ana Mendieta’s La Vivificación de la Carne: El Laberinto de Venus Series (1982), at Carla Stellweg Gallery, New York, 1983. Image courtesy of Stellweg Partners NY LLC. DD: Did the artists produce works specifically for each exhibition or were they previously made works? How did you promote them? CS: It was a combination. Some works were made prior. However, the program was always a dialogic process starting with an idea of the artists. One day I combined David Lamelas’s work with Luis Camnitzer’s work, who at that time were both part of an underrepresented generation of really significant conceptual artists. Nobody or very few people bought their work! I recall that in the late nineties León Ferrari came to New York to do a show at the Drawing Center. On that occasion, he brought 30 drawings, each at $300, which I could not place in one collection! The only museum person who visited the gallery regularly and motivated her board to do the same and to begin collecting was Marcia Tucker from the New Museum. My former institutional contacts basically just came to see what and who were there, to socialize saying things like, “You are doing such a great job, keep it up!” At that time, I raised the funds needed to keep the gallery going by speculating on the secondary market. I had a pretty good eye, especially for very contemporary works, and had built a clientele in Europe for that sort of work, some of whom then began also to collect Latin American art. Also, before I opened my gallery, I curated a show of Latin American artists working in New York at Samuel Dorsky’s gallery in New Paltz before it turned into a museum. After that, Mr. Dorsky and I remained close friends, and he was a strong supporter of the gallery until his death. In addition, the younger generations of Latin Americanists, who were then still studying, like Ana Sokoloff, Monika Amor, etc., would come and we’d talk and share my specialized library. In the process I became an ad hoc mentor—another role I continue to be interested in! In that sense, my space was a hybrid space, cultivating collectors to learn about and buy our art, while also acquiring knowledge that was not necessarily available in books. Then, in 1997, I was awarded a Rockefeller Foundation Fellowship for the Humanities, and in addition I had already observed that the major New Y0rk galleries had started to incorporate Latino Artists in their program; my role had been to plant the seeds that were then beginning to bear fruit. That was the moment I decided to close the gallery. DD: Do you feel that there has been a positive evolution of the interest in Latin American and Latino art in the US since you started working then? CS: What has happened institutionally in the US and several European museums regarding Latin American art is the creation of Latin American Committees that finance acquisitions and fund curatorial positions and exhibitions, all in an effort to identify specific “Latin American” art with its own specificities and historical background. It is true that we are looking at many positive results today, however, it seems to me to be taking a very long time for that “upward mobility” to happen. Raphael Montañez-Ortiz, founder of El Museo del Barrio and a Boricua born Neoyorican, shows with Pamela Echeverría at LABOR Gallery in Mexico City, which means she has a clientele for his work… Meanwhile, there are also many artists who are finally making it inside the institutional circuits and the marketplace, thanks to a few brilliant promoters and dealers and museum people, but many more are not. Carla Stellweg interviewing José Luis Cuevas. Unidentified author. Artists of the II Salón Independiente, 1969. Extensión Universitaria, IISUE/AHUNAM/Colección Universidad/Sección:Extensión Universitaria/CU-005462. DD: You are talking about Nixon and the way his presidency affected notions of how culture should function within society. Now there is Trump, a conservative of yet another breed. How do you predict his policies will affect the production of contemporary art in the Americas, both symbolically and on a production/market level in the next few years? CS: My instinct tells me artists will be more and more inclined to feel that it is key and ethically responsible to do work that addresses Trump’s disastrous policies, which are pushing not only the US but all of the Americas further and further backwards. Just look at topics such as immigration, ecology, women’s rights, etc. How that art will be made, and in what shape or form will it come, I cannot predict. As to the general field of arts and cultural: The Trump Era dictates anti-art. Dismantling the National Endowment of the Arts and the National Endowment for the Humanities, just listen to his dismissal and highly volatile arts and culture tweets that are not just derogatory but despicable! Look at what he tweeted about the new US Embassy in London, whose opening he refused to attend. This embassy is filled with fantastic contemporary art—Mark Bradford, Rachel Whiteread, you name it. Anyway, Trump is a disgrace. We have a tough battle ahead but it has to be fought, resistance may not be enough. DD: Can you tell us about a few of your upcoming projects? CS: It would be great to finish a project I began with Gamboa back in the 1970s to show how art is transnational, with exhibitions of US artist who created a body of work in Mexico or Latin America. I had already done Milton Avery: In Mexico and After, and was planning on doing Robert Smithson, not just his Hotel Palenque, but all the works he did in the Yucatán, or Stuart Davis in Cuba… However, as we said earlier, we can only go forward. De izquierda a derecha: Rubén Ortiz-Torres, Rita Alazraki, Carla Stellweg y Rina Epelstein, en el estudio de Rubén en La Quiñonera, Ciudad de México, 1989. Fotografía por Adolfo Patiño. Imagen cortesía de Stellweg Partners NY LLC. 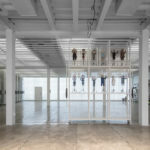 Dorothée Dupuis: El otoño pasado el Pacific Standard Time, una iniciativa de arte contemporáneo de la Getty Foundation, tuvo lugar como cada cinco años en colaboración con más de cien instituciones de arte, galerías y espacios independientes en la región más amplia de Los Ángeles. El tema y enfoque de esta edición fue la conexión entre las artes en América Latina y Los Ángeles, así como sus conexiones con las mayores comunidades artísticas latinas. Decidimos dedicar la edición de otoño de Terremoto a las prácticas artísticas chicanx/latinx, articulándolas en torno al concepto de contrabando. Desde que conocí Artes Visuales, la revista trimestral bilingüe producida por el Museo de Arte Moderno (MAM) en la Ciudad de México de 1973 a 1981 —y de la que eras co-fundadora y directora— he estado pensando en las sorprendentes similitudes entre nuestras dos publicaciones. ¿Podrías primero platicarme sobre el concepto de Artes Visuales? ¿Especialmente sobre la edición dedicada al arte chicano en 1981? Parece que fueron la primera revista en realmente abordar el tema. Carla Stellweg: Ciertamente fuimos la primera revista en América Latina en enfocarnos en arte chicano. 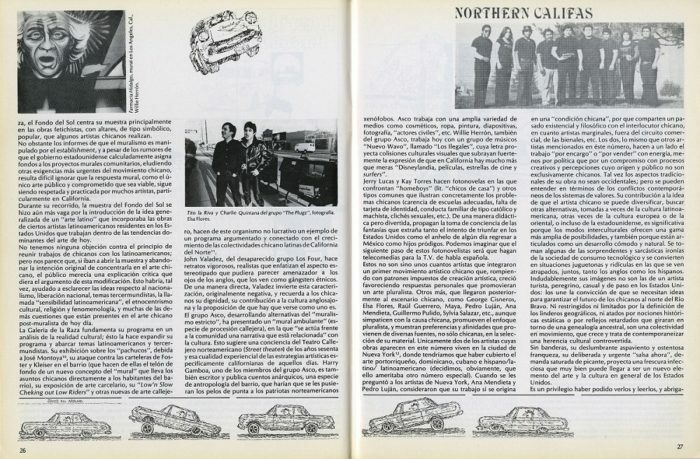 En 1979, Los Angeles Institute for Contemporary Art (LAICA, como se le conocía) me invitó como crítica en residencia del NEA para editar una edición bilingüe sobre arte latinoamericano para su journal. 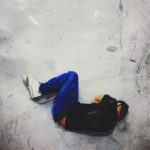 Elaboré un cuestionario de cinco puntos que se envió a un grupo selecto de curadores, profesionales del arte y artistas latinoamericanos viviendo y trabajando en América Latina y algunos viviendo y trabajando en EE.UU. De estas cinco preguntas la última cuestionaba qué sabían o habían escuchado sobre arte chicano. Sólo dos personas respondieron esta pregunta, una fue Hélio Oiticica y la otra fue Luis Camnitzer. En todo caso, el NEA pedía que yo condujera tres ponencias en torno a Los Ángeles. En la primera charla, había dos chicos latinos que se sentaron en la fila del frente quienes, durante la sesión final de preguntas y respuestas, hicieron algunas preguntas muy articuladas. Después de que la plática terminó, se fueron antes de que nos pudieran presentar. Dos semanas después, en otra sede, otra vez los mismos dos chicos estaban sentados en la fila del frente. Esta vez me acerqué y comenté: “Saben, no voy a dar una conferencia distinta a la que ya escucharon, ¡así que tal vez se aburran!” Y entonces sugerí que después cenáramos juntos en Chinatown. ¡Pronto se hizo evidente que estaban al tanto de lo que estaba pasando! Antes de esto yo había empezado a examinar la posibilidad de dedicar una edición específicamente al increíble nuevo arte producido en Cuba —la primera generación de graduados del Instituto Superior del Arte (ISA)—, esto fue un poco antes de la Bienal de la Habana, la cual fue iniciada por Yillian Yanes. 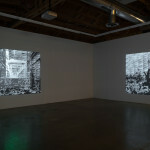 En su lugar, les pregunté a los dos chicos latinos, Roberto Gil de Montes —uno de los fundadores de LACE (Los Angeles Contemporary Exhibitions)— y Eduardo Dominguez, Eddy, si podía ser que extendiera mi estancia y ellos me llevaran a visitar estudios por toda la ciudad, y les dije que tal vez, después de evaluar el material que observáramos, podríamos pensar en hacer una edición entera de Artes Visuales sobre arte chicano. Mi interés se encontraba más en el nuevo arte conceptual y la cultura visual popular chicana —fotografía, cómics, foto-novelas, videoarte— que en la herencia tradicional del muralismo mexicano. Esta primera edición sobre arte chicano, o si prefieres latinx, no fue fortuita, se trató más bien sobre hacer la pregunta correcta en el momento adecuado. Si no les hubiera invitado a unir fuerzas conmigo, ¡el número de Artes Visuales probablemente se hubiera convertido en una representación más convencional de arte chicano o latinx que el que acabamos editando juntos! Portada de Artes Visuales, no. 29. Publicado por el Museo de Arte Moderno, Instituto Nacional de Bellas Artes y la Secretaría de Educación Pública, Ciudad de México, verano 1981. Imagen de portada: Louis Carlos Bernal. Escaneos por Tessa Morefield. Imagen cortesía de Stellweg Partners NY LLC. DD: Tenías esta carrera exitosa en la Ciudad de México empezando en 1965 y hasta los ochentas. Editabas la revista Artes Visuales, a la par que trabajabas con Fernando Gamboa, uno de los directores institucionales más importantes de su época. Luego, en los ochentas te encontramos de vuelta en Nueva York. ¿Qué pasó? 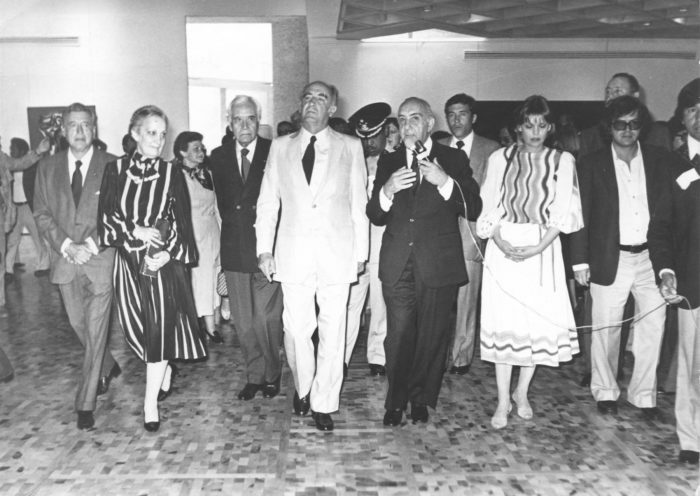 De izquierda a derecha: esposo de Doña Garza Sada de Sepúlveda; Doña Margara Garza Sada de Sepúlveda; Rufino Tamayo, Presidente José Lopez Portillo; Fernando Gamboa; y Carla Stellweg, en la apertura del Museo Tamayo, Ciudad de México, 1981. Imagen cortesía de Stellweg Partners NY LLC. DD: Te defines frecuentemente como latinoamericanista —¿cómo incluye eso el arte latino? CS: Antes del PST LA/LA del año pasado, hubo varios paneles en el Getty, me invitaron a dos de ellos, y Ruben Ortiz-Torres moderó uno. En otro panel acerca de la exhibición Home que se presentaba en el LACMA participaban el artista Daniel Joseph Martinez, con Mari Carmen Ramírez, Chon Noriega, Gerardo Mosquera y algunos otros. El tema alrededor de qué es o era el arte latino, surgió eventualmente en la plática. En cierto punto, Martinez agregó: “no existe tal cosa como arte latino”. Es justo como el arte latinoamericano, ¿qué es? ¡Puede ser muchas cosas! Durante los últimos cuarenta años la pregunta sigue surgiendo. 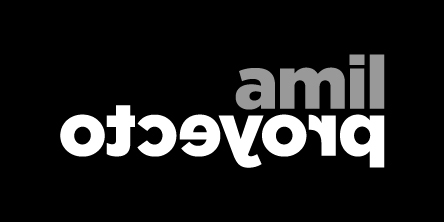 Desde mi perspectiva un latinoamericanista es alguien que promueve y crea plataformas para la visibilidad y conocimiento en torno a obras hechas por artistas de o en América Latina. Se trate de obras políticas, comprometidas conceptualmente, o todas las formas de abstracción, incluyendo arte concreto, neo-concreto, cinético y óptico. En mi caso, no fue una decisión, sólo pasó. Soy una ciudadana holandesa que se mudó a México cuando tenía 16. Mi formación intelectual es mayormente producto de mis años en México. Adopté a México tanto como México me adoptó a mí. Ser una latinoamericanista no es una cosa esencial, es una práctica y en mi caso insistí en incluir a los artistas latinos en esta categoría. No crecí con latinos, pero actualmente hay unos 30 millones de ciudadanos estadounidenses de uno u otro origen latino, un compuesto de inmigrantes de Cuba, Puerto Rico, República Dominicana, además de todas las otras naciones caribeñas, y chicanos. Desplegados de Artes Visuales, no. 29. Publicado por el Museo de Arte Moderno, Instituto Nacional de Bellas Artes y la Secretaría de Educación Pública, Ciudad de México, verano 1981. Escaneos por Tessa Morefield. Imagen cortesía de Stellweg Partners NY LLC. Regresando a lo que es arte latinoamericano. La necesidad de un diálogo hemisférico siempre ha existido. Tradicionalmente, en los EE.UU., la Costa Este siempre ha sido considerada como la que tiene más poder económico y político; NYC, Washington DC, Boston: mirando a Europa y conectada a ella por múltiples razones. La maquinaria militar de la Segunda Guerra Mundial forjó nuestra revolución tecnológica con el subproducto de la rápida comunicación, la cual ha cambiado todo en el mundo arte. Durante la SGM y la Guerra Fría, era geopolíticamente importante para EE.UU. intentar mejorar su discusión hemisférica, porque había una cantidad creciente de gobiernos pro-soviéticos en América Latina, lo que era visto como una amenaza para el interés nacional de EE.UU., así como para sus intereses corporativos. Hablé sobre esto recientemente en un panel en el Museo Jumex, argumentando que para hablar sobre el concepto de América Latina primero debes hablar sobre los 40s y la Guerra Fría. El congreso y senado de EE.UU. sancionaron aquellos programas de arte y cultura que se volvieron hemisféricos, para crear redes alternativas a esas que existían previamente con Europa. Para conocer lo que la gente pensaba, y los sistemas que aquellos en Latinoamérica estaban dispuestos a apoyar política, económica, financieramente, etc. La política cultural de la Guerra Fría utilizó el expresionismo abstracto, la Escuela de Nueva York, y promovió el trabajo de artistas latinoamericanos como José Luis Cuevas al lado de Edgar Negret o Botero, en exposiciones curadas por José Gómez Sicre, en el OAS Museum of Latin American Art en DC, o en los textos seminales de arte latinoamericano por Marta Traba. Hoy, pareciera que estamos en la recta final de la abstracción, los diversos momentos que fueron inteligente y sólidamente canonizados por Mari Carmen Ramirez en sus exposiciones seminales y el catálogo Inverted Utopias (Utopías invertidas) desde 2004. Preferir el arte basado en la protesta y cargado políticamente hasta lo que es conocido hoy como “estética relacional” pareciera responder a los tiempos problemáticos, y por un momento, parecía ser un antídoto para la Frida Kahl-ización (entre otras figuras mitológicas) del arte latinoamericano. La figuración histórica está más basada en la realidad y anclada al activismo social o si prefieres, una vez más en la “estética relacional”. La abstracción es más cómoda, neutral y no-comprometida, agradable a los ojos y a la mente. 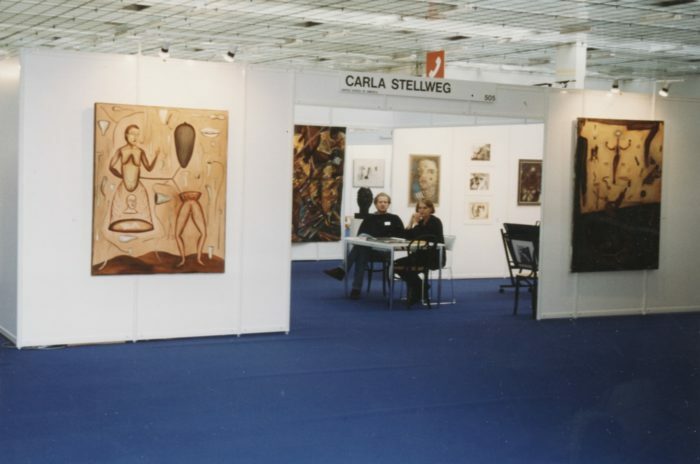 Carla Stellweg con Tjerk Wiegersma en el booth de Carla Stellweg Gallery durante la Feria de Arte de Bruselas, Palais des Beaux-Arts, Bruselas, 1994. Imagen cortesía de Stellweg Partners NY LLC. DD: En 1989, abriste una galería en tu loft en Nueva York, dejando de lado por un momento tu carrera institucional. ¿Por qué decidiste hacer eso? CS: Había hecho todas estas cosas y había experimentado transformaciones profesionales, aunque siempre fue bajo el amparo de instituciones. Era tiempo de ser independiente, de hacer mi propio proyecto sin estar vinculada a una institución —al menos no por un rato. Había vivido y trabajado en Nueva York muchas veces, unos años, unos meses. Después de que Artes Visuales fue censurada y dejo de existir, vine a Nueva York desde México en enero de 1983. Desde 1978, había rentado ese loft, mismo que usaba cuando solía ir y venir, cuatro veces al año. Artistas venían frecuentemente, nos preguntábamos después de la desaparición de Artes Visuales dónde y cómo podrían exhibir y vender su obra aquí. Estaba claro que había una oportunidad de introducir al público algo que sentía muy fuertemente que debía ser visto. Ana Mendieta venía a México, que es como nos convertimos en amigas muy cercanas —en cierto punto incluso tenía doce de sus obras. Ella, así como Regina Vater y Ana Maria Maiolino, quien vivía a la vuelta de la esquina, y estaba también Luis Frangella que murió de SIDA, él vivía en Forsythe Street también a la vuelta de la esquina, Catalina Parra de Chile también estaba aquí… Seguí trabajando como consultora freelance hasta 1983, después abrí un espacio en Mercer Street en Soho, mi primera galería, luego me volví la curadora en jefe en el ahora difunto Museo de Arte Hispánico Contemporáneo. En 1989 hubo una importante caída en el mercado. Muchas de las galerías de Soho estaban cerrando, y yo pensaba, “Lo que cae volverá a subir, y lo que está arriba caerá”, y decidí abrir mi segundo espacio, esta vez en mi loft. Las propiedades eran ya demasiado caras, y yo vivía en un departamento de 4000 pies cuadrados sin paredes, un espacio enorme. Por lo tanto, empezamos por construir paredes, aislar la zona de la cocina, etc. y así fue cómo comenzamos, invitando contactos de todos, gente que importaba y tenía influencia. Incluso hice ferias de arte. De hecho, estaba en el comité de exhibición de Miami Art Fair, mucho antes de Basel Miami, que también se hacía en el Centro de Convenciones. De izquierda a derecha: Dolores y el artista de graffiti Blade; Carla Stellweg sentada junto a Octavio Hinzpeter, asistente de galería; el artista de graffiti Seen frente a la obra La Vivificación de la Carne: El Laberinto de Venus Series (1982) de Ana Mendieta, en la Galería Carla Stellweg, Nueva York, 1983. Imagen cortesía de Stellweg Partners NY LLC. DD: ¿Los artistas hacían obras específicamente para cada exposición o eran obras hechas previamente? ¿Cómo los promovías? CS: Era una combinación. Algunas obras eran hechas con anterioridad. Sin embargo, el programa siempre era un proceso dialógico empezando con una idea de los artistas. Un día junté la obra de David Lamelas con la de Luis Camnitzer, quien en ese momento era parte de la generación realmente significativa de artistas conceptuales subrepresentada. ¡Nadie o muy pocas personas compraban su obra! Recuerdo que en los 90s, León Ferrari vino a Nueva York, a hacer una exposición en el Drawing Center. En esa ocasión, trajo 30 dibujos, cada uno en $300, ¡que no podía colocar en una colección en esa época! La única persona que visitó la galería regularmente, y motivó a su patronato a hacer lo mismo, fue Marcia Tucker del New Museum. Mis antiguos contactos institucionales básicamente sólo vinieron a ver qué y quiénes estaban ahí, para socializar diciendo cosas como “Estás haciendo un gran trabajo, ¡continúa así!”. En esa época, recaudaba los fondos necesarios para mantener la galería especulando en el mercado secundario. Tenía muy buen ojo, especialmente para obras muy contemporáneas, y había construido una clientela en Europa para ese tipo de piezas, algunos de los cuales empezaron también entonces a coleccionar arte latinoamericano. Además, antes de que abriera mi galería, curé una exhibición de artistas latinoamericanos trabajando en Nueva York en la galería de Samuel Dorsky en New Paltz, antes de que se convirtiera en un museo. Después de eso, el Sr. Dorsky y yo seguimos siendo amigos cercanos, y fue un gran apoyo para la galería hasta su muerte. De igual manera, las generaciones más jóvenes de latinoamericanistas, que estaban en ese entonces todavía estudiando, como Ana Sokoloff, Monika Amor, etc. vendrían, y hablaríamos y compartiríamos mi biblioteca especializada, en el proceso me convertiría en una mentora ad hoc —¡otro rol que sigue siendo de mi interés! En ese sentido, mi espacio era un espacio híbrido, fomentando a los coleccionistas el aprender y comprar este arte, mientras adquirían conocimiento que no estaba necesariamente disponible en libros. Después en 1997 me otorgaron la Beca para las Humanidades de la Rockefeller Foundation, y en suma había observado que las mayores galerías de Nueva York habían empezado a incorporar artistas latinos en su programa; mi rol había sido plantar las semillas que serían cosechadas después. Ese fue el momento en que decidí cerrar la galería. DD: ¿Sientes que ha habido una evolución positiva del interés hacia el arte latinoamericano y latino en EE.UU. desde ese momento en que empezaste a trabajar? CS: Lo que ha pasado institucionalmente —en EE.UU. y en varios museos europeos—, en cuanto al arte latinoamericano, es la creación de Comités Latinoamericanos que financian adquisiciones y fondean posiciones curatoriales y exposiciones. Todo en un esfuerzo por distinguir el ‘arte latinoamericano’ en específico y sus idiosincrasias. Es verdad que estamos viendo muchos cambios hoy en día; sin embargo, me parece que está tomando mucho tiempo —para que suceda esa ‘movilidad ascendente’. Raphael Montañez-Ortiz, fundador de El Museo del Barrio y un nuyorriqueño nacido boricua, hizo exposiciones con Pamela Echeverría en LABOR en la Ciudad de México, lo que significa que tiene una clientela para su trabajo. Mientras tanto, también hay muchos artistas que finalmente lo están logrando dentro de los circuitos institucionales y el mercado, gracias a unos pocos promotores y comerciantes y gente de museos brillantes, pero muchos otros no. Carla Stellweg entrevistando a José Luis Cuevas. Autor no identificado. 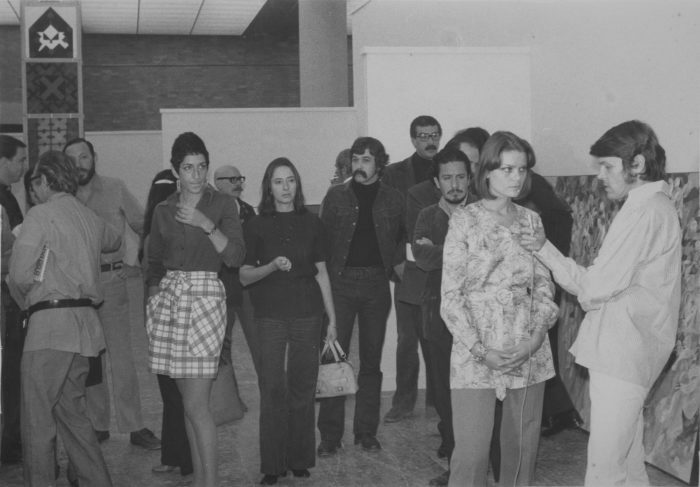 Artistas del II Salón Independiente, 1969. Extensión Universitaria, IISUE/AHUNAM/Colección Universidad/Sección:Extensión Universitaria/CU-005462. DD: Estás hablando de Nixon y de la forma en que esto afectó las nociones de cómo la cultura debería funcionar dentro de la sociedad. Ahora está Trump, un conservador de otro tipo. ¿Cómo puedes predecir que sus políticas afectarán la producción del arte contemporáneo en las Américas, tanto simbólicamente como a nivel de producción/mercado, en los próximos años? CS: Mi instinto me dice que los artistas estarán cada vez más inclinados a sentir que es fundamental y éticamente responsable crear obras que aborden las desastrosas políticas de Trump que están empujando en retroceso no sólo a EE.UU. sino a todas las Américas. Solo observa los temas como inmigración, ecología, derechos de las mujeres, etc. ¿Cómo ese arte se realizará y en qué formas sucederá? No lo puedo predecir. En cuanto al campo de las artes y cultural en general: la era de Trump dicta que no quieren nada de eso. Desmantelar el Fondo Nacional de las Artes y el Fondo Nacional para las Humanidades, o sus tweets de rechazo y altamente volátiles sobre arte y cultura, no son sólo despectivos sino despreciables. Ve lo que tuiteó sobre la nueva Embajada de EE.UU. en Londres, además de que canceló su viaje a esta apertura. La embajada está llena de arte contemporáneo fantástico —Mark Bradford, Rachel Whiteread, tú dilo. A lo que vamos, Trump es una desgracia. Tenemos una batalla difícil por venir, pero tiene que ser peleada, la resistencia puede no ser suficiente. DD: ¿Nos puedes platicar sobre algunos de tus proyectos futuros? CS: Sería genial terminar un proyecto que comencé con Gamboa en la década de 1970 para mostrar cómo el arte es transnacional, con exposiciones de artistas estadounidenses que crearon un cuerpo de trabajo en México o América Latina. Ya había hecho Milton Avery: In Mexico and After, y estaba planeando hacer Robert Smithson, no sólo su Hotel Palenque, sino todos los trabajos que hizo en Yucatán, o Stuart Davis en Cuba… Sin embargo, como dijimos antes, sólo podemos ir hacia delante.